… you have DJs and producers from all over the world who were inspired by the founders of Techno. Johnny Nevin: Can you tell us what the Movement Music Festival is all about, where it happens, and all of that? Kasia Ooh: The Movement Music Festival is in Detroit, it’s centrally located in Hart Plaza, which is this futuristic scene. It’s all stone, metal sculptures, there’s a pyramid — it was completely mind blowing the first time I saw it. 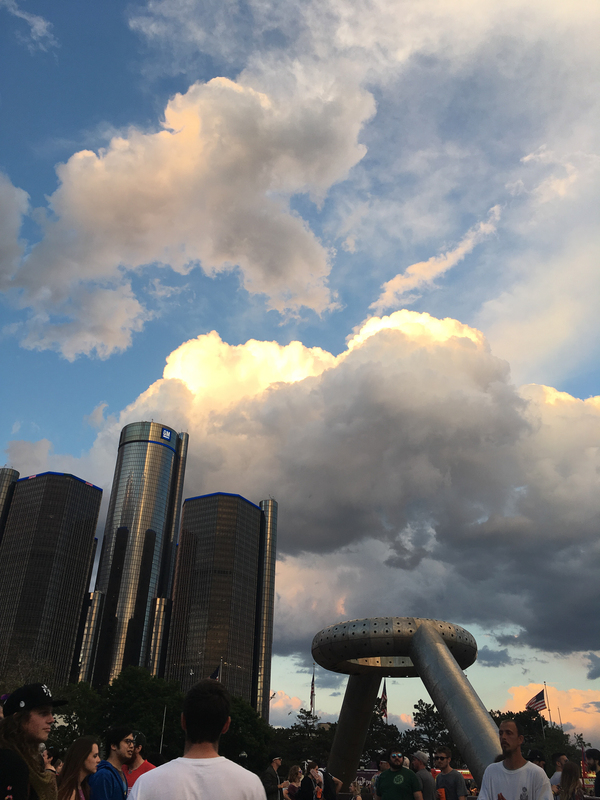 The music is Techno — it started as a free festival called the Detroit Electronic Music Festival, and since Detroit is the birthplace of techno, you have DJs and producers from all over the world who were inspired by the founders of Techno. Johnny: You have your own history with Movement — you’ve been going for years, you’re the head of their Chciago street team. Can you tell us why you keep going back? Kasia: I keep going back because the energy that I feel there is different from any thing else I’ve ever seen. I’ve been to a lot of festivals, in a lot of different countries, and there’s no place like Detroit on Memorial Day Weekend. Everybody’s happy, everybody’s dancing — it’s like the ultimate celebration of life and music. I was still sick when I first went to Detroit, and I probably danced for seventy-two hours straight. Johnny: Is there house scene there as well? Detroit has as rich a house scene as Chicago. I remember when the first house tracks came out of here, it was only a year or two before the whole Detroit house scene started happening. … there’s no place like Detroit on Memorial Day Weekend. Everybody’s happy, everybody’s dancing — it’s like the ultimate celebration of life and music. Kasia: Yeah, there’s a House sceene — Detroit and Chicago are like sister cities where music is concerned, and for that matter there’s a tech house scene there too. Johnny: You had a big part in the rave scene here in Chicago, and the roots of a lot of what is happening now — can you tell us a little about what that was like? Kasia: It was hectic, I kind of fell into the underground scene here, fast and hard, throwing underground parties with a good friend of mine who I probably met the day I fell in love with electronic music. It’s a beautiful scene, the electronic music scene, it doesn’t matter what you’re background is, it’s all about love. Any city you travel to, the electronic scene is everybody’s family. Johnny: Having been to Movment so many times, what can you tell anybody who’s thinking about going this year? Kasia: Don’t think about it, just go. It’ll be a life changing experience. It definitely changed my life for the better. The Movement Music Festival takes place Saturday, Sunday and Monday, May 25 – 27. A full look at the lineup, along with ticket information is available online at movement.us.